The Electricide CDE series electro-chemical chlorine dioxide generators are ideal for disinfection applications in the potable water, food and beverage industries. Why? Purity. The chlorine dioxide produced by the CDE generators has very high purity. Chlorine dioxide is produced in an electrochemical cell from the oxidation of chlorite ion. The chlorine dioxide solution is then recirculated through a stripper to remove chlorine dioxide gas in pure form. The chlorine dioxide gas is then dissolved into dilution water to produce a solution of 2,000 ppm. As pure chlorine dioxide gas is used to make the chlorine dioxide solution, there can be no other impurities or reaction by-products present. This method is totally different to other generation systems where chlorite or chlorine is always present in the chlorine dioxide solution. If you are going to disinfect water and use it for human consumption, it would seem logical to choose the method of disinfection which has the highest purity and lowest risk to human health. Chlorine dioxide generated by our CDE generator is what you are looking for. Reaction by-products from the presence of chlorine such as Trihalomethanes (THM’s), HAA’s, chloramines and chlorophenols will not be formed with the CDE series chlorine dioxide generators. So, the water you use for drinking, process or product contact will be of the highest quality. Safety. Acid-chlorite (2-chemical) generators use hydrochloric acid and sodium chlorite as reactant. These two chemicals react together inside a reaction chamber to form chlorine dioxide at high strength (2%). It is clear that these two chemicals are incompatible, as they react to form chlorine dioxide. This is fine as long as the reaction occurs in a reaction vessel, there are no leaks and the chemicals are stored correctly. There is an inherent safety risk associated with the handling of two incompatible chemicals. There is always the possibility (however small) that an operator could spill one chemical into the other, outside the generator and form chlorine dioxide. Handling acid is always a problem as it fumes and is nasty to work with. We have seen many sites where acid is stored and the sheds are corroded from the acid fumes. With acid, chlorite, hypochlorite (3-chemical) generators, the chemical handling scenario is even more complex as 3 chemical must be handled by an operator. With the Electricide CDE generator, the chemical handling risks are removed as there is only one chemical and no acid. Multiple point dosing using an acid-chlorite generator is complex as a dilution tank with level sensors has to be added to the basic generator. The Electricide CDE generator is designed for multiple point dosing and only requires the addition of one dosing pump per dosing point. The system has a cetral touchscreen controller which provides an interface for control of each dosing point via flow, residual or combined flow/residual. The Electricide CDE generator can be accessed remotely via the internet. This aspect is very useful for remote sites and where chlorine dioxide addition to an application is very critical. Our service tech’s can get on-line and investigate problems, start and stop the unit and get the unit running quickly without having to attend site. A wired connection to the unit is not required. Application: Chlorine Dioxide disinfection of process water for contact with food products. Raw water is pumped from the local river into a 1ML underground storage dam. This water is continually circulated with a small centrifugal pump. Chlorine dioxide solution is generated and dosed into this recirculation line on the basis of the chlorine dioxide setpoint of 0.40 ppm. Chlorine dioxide residual is measured using a chlorine dioxide transmitter and an amperometric probe. Using PID control and the make-up water flow signal, a PID control output is calculated which is provided as a 4-20mA signal to a chlorine dioxide dosing pump. The chlorine dioxide generator is located inside a plant room with IBC storage of chemical inside a fibreglass IBC bund. Chemical flows under gravity to the generator. 20% caustic is produced as a free by-product and this is collected in a 500L HDPE tank from which it is pumped to a bulk storage tank for re-use. The complete system is controlled with a PLC and touchscreen which interfaces with the site SCADA system. 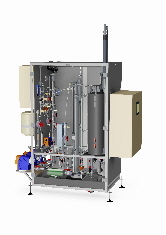 For more information on electrochemical chlorine dioxide dosing systems, download the brochure, or to obtain a quotation, please complete the feedback form on our Contact page.